It turns out you are never too young for summer camp horror. 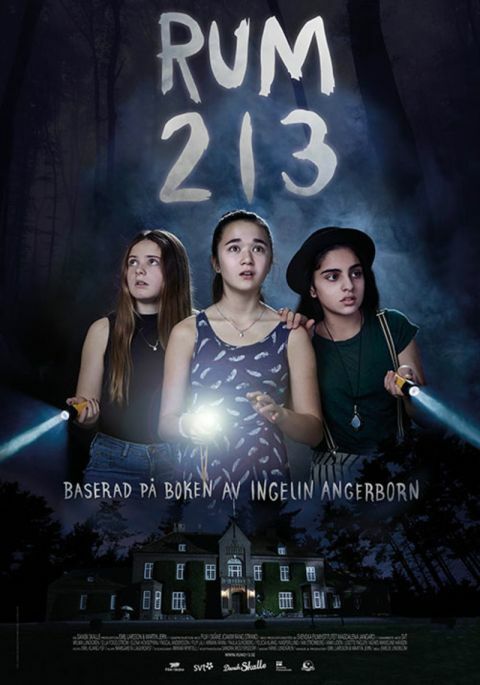 At least Elvira and her sixth-grader friends will be spared the gore of the Sleepaway Camp and Friday the 13th franchises, but they will still get plenty scared in Emelie Lindblom’s family-appropriate tale of terror, Room 213 (trailer here), which screens during the 2017 TIFF Kids International Film Festival. Initially, Elvira and her roommates Meja and Bea had different digs, but plumbing issues forced them to move to the long-unused #213. Of course, there is a darned good reason why their room is traditionally shuttered, but the current crop of counselors doesn’t know or is just hoping for the best. Soon each girl has an item of great personal significance stolen. They immediately suspect each other, but a series of spooky incidents leads them to look for more supernatural explanations—like a ghost. Mebel would fit the bill perfectly. There is indeed a history of sightings of the red-haired camper who died under mysterious circumstances. However, there are also boys at the camp, so there will be other causes of jealousy and angst. They will only be at Camp Something-with-Several-Umlauts for one week, but what the three girls see will haunt them all their lives, or so the Mary Roberts Rinehart-esque opening narration tells us. For a children’s film with absolutely, positively no violence, Room 213 is impressively eerie. It is worth noting the Swedish title is Rum 213, as in “red rum,” so there you have it. Although younger viewers will easily identify with the sensitive Elvira, grown-ups will find it compelling to watch the youngsters dealing with paranormal encounters in a very realistic way. Elvira’s stormy BFF relationships with Meja and Bea also rings true for girls their age. Wilma Lungren shines as the somewhat shy middle class Elvira, showing tremendous presence in nearly every scene. She also develops completely believable rapport with Ella Fogelström as the mean-ish rich girl Meja and Elena Hovsepyan as more economically disadvantaged Bea. While Martin Jern and Emil Larsson’s adaptation of Ingelin Angerborn’s YA novel is rather short on answers, it ends up in a pretty cool place. Without question, it is way more satisfying than some of the midnight movies on tap for next week. Recommended for viewers of all ages who enjoy a good ghost story, Room 213 screens up north (Toronto) this Saturday (4/22) and Sunday (4/23), as part of TIFF Kids.